This is a post that was originally published on the SDL website in two parts which are combined here in a single long post. This post also reflects the expertise of my colleague Matthias Heyn, VP of Life Sciences Solutions at SDL. This first post in an ongoing series takes a closer look at the emerging use and acceptance of machine translation (MT) in the Life Sciences industry. We take a look at the expanding role MT is likely to have in the industry over the coming years and explore some key use cases and applications. Consumers share information in many ways, across a variety of digital platforms. It has become increasingly necessary to monitor these platforms to stay abreast of trends, impressions, and problems related to their products. It is useful to consider some of the salient points behind this growing momentum. The content that needs translation today is varied, continuous, real-time and always flowing in ever greater volumes. We can only expect this will continue and increase. The use of global public MT portals is in the region of an estimated 800 billion words a day. This is astounding to some in the localization industry who account for less than 1% of this, and it suggests that MT is now a regular part of digital life. Everyone, both consumers and employees in global enterprises, use it all the time. 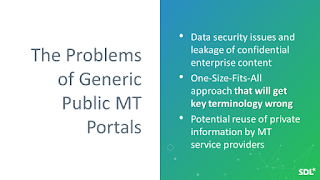 This use of public MT portals also involves many global enterprise workers, who may compromise data security and productivity by using these portals. However, the need for instant, always-available, translation services is so urgent that some employees will take the risk. Some large global enterprises recognize both the data security risks entailed by this uncontrolled use and the widespread need for controlled and integrated MT in their digital infrastructure. In response, they have deployed internal solutions to meet this need in a more controlled manner. There are several reasons why Life Sciences has not used MT, including quality requirements, lags in technical adoptions, global need and non-optimized MT capabilities. The Life Sciences industry needs high quality, accurate translations given that often the life and death of human beings could be at stake if a translation is inaccurate, creating a subject-matter-expert-dependent and verified quality mindset. The industry saw little benefit from using MT since it was so hard to control and optimize. Depending on the kind of errors, there can be catastrophic consequences from failures and thus a general “not good enough for us” attitude within the industry. Occasional breaking news about MT mishaps did not help. The Life Sciences industry is not typically early adopters of new technologies. Historically Life Sciences organizations have focused on technology and innovation in targeted areas but that is changing as the need to innovate in multiple areas is only increasing to stay competitive. It is no longer a nice to have, it’s a must-have. At the same time, technologies like machine translation have evolved and improved significantly over the last few years which has impacted how MT is viewed. Machine Translation is now seen as a viable and effective solution to address certain global content challenges. There’s a concern about risk management/mitigation. Life Sciences organizations have been concerned about the risk involved in leveraging machine translation due to the data security aspects as well as the ability to handle their industry-specific terminology requirements. 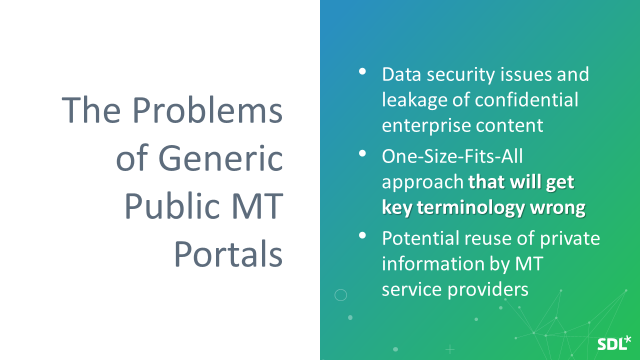 Generic MT solutions like Google do not provide adequate data security and tailoring controls for the specific needs of an enterprise. Once something is translated using Google Translate it is potentially available in the public domain. Data privacy and security is a top priority for Life Sciences companies and the need for an Enterprise MT solution that provides the benefits of MT technology but with the necessary security, elements are essential. Additionally, there were many use cases where the enterprise needed to have the MT capabilities deployed in private IT environments, and carefully integrated with key business applications and workflow. But compelling events are forcing change.. The massive increase in the volume of content in general and high volumes of multilingual content from worldwide digitally connected and active patients and consumers are key drivers for the enterprise adoption of MT across the industry. In the Life Sciences industry, an exponential increase in internal scientific data (particularly in genomics and proteomics data) has triggered global research. This research has led to new ways to develop drugs, knowledge about disease pathways and manifestation, and to the development of tailored treatments for individual patients. Keeping abreast of potentially breakthrough research, much of which may be in local languages has become a competitive imperative. 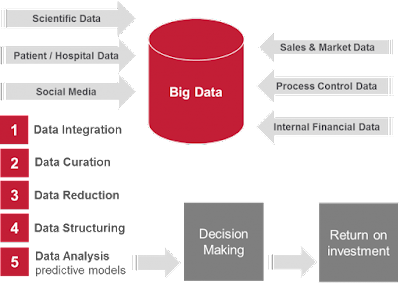 Aggregated data: The ability to aggregate data from multiple reporting sources has also increased the volume and flow of such data. Signals related to problems and adverse effects may appear in any language, anywhere in the world. The need to monitor and understand this varied data grows in importance as information today can spread globally in hours. Safety concerns can have serious implications for patient health and on a company’s financial health and reputation. These concerns need to be monitored to avoid derailing a drug that may be on track to become an international success. Additionally, another important use for machine translation is in the social media and post-marketing area. Life Sciences organizations can compile large amounts of data from multiple languages leveraging MT technology. Monitoring sentiment across all language groups allows Life Sciences organizations to track market-specific issues, sentiment and explain trends. It also helps develop marketing and communication strategies to handle dissatisfaction and avoid crises or to build further momentum to ride positive sentiment. ML and AI technologies are also applied to monitor and predict epidemic outbreaks around the world, based on satellite data, historical information on the web, real-time social media updates, and other sources. For example, malaria outbreaks predictions take into account temperature, average monthly rainfall, the total number of positive cases, and other data points. Increasingly the aggregated data that makes this possible is multilingual and voluminous and requires MT to enable more rapid responses. Indeed, such monitoring would be impossible without machine translation. MT quality has improved dramatically in recent years, driven by the recent wave of research advances in machine learning, increasing volumes of relevant data to train these systems, and improvements in computing power needed to do this. This combination of resources and events are key drivers for the progress that we see today. The increasing success of deep learning and neural nets, in particular, have created great excitement as successful use cases emerge in many industries, and also benefit a whole class of Natural Language Processing (NLP) applications including MT. 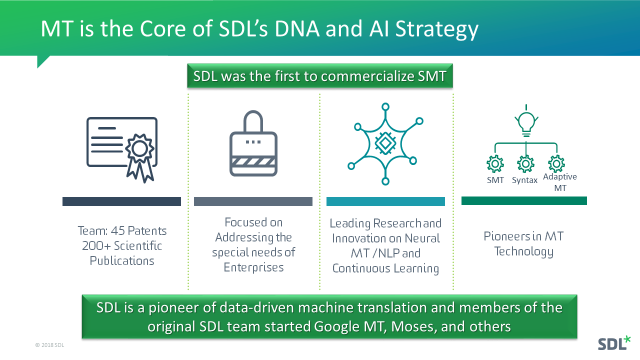 SDL is a pioneer in data-driven machine translation and pioneered the commercial deployment of Statistical Machine Translation (SMT) in the early 2000’s. The research team at SDL has published hundreds of peer-reviewed research papers and has over 45 MT related patents to their credit. While SMT was an improvement over previous rules-based MT systems, the early promise plateaued, and improvements in SMT were slow and small after the initial breakthroughs. Neural MT changed this and provided a sudden and substantial boost to MT capabilities. Most in the industry consider NMT a revolution in machine learning rather than evolutionary progress in MT. The significant improvements only represent the first wave of improvement, as NMT is still in its nascence. At SDL our first generation NMT systems improved 27% on average over previous SMT systems. In some languages, the improvement was as much as 100%, based on the automatic metrics used to measure improvement. The second generation of our NMT systems shows an additional 25% improvement over the first generation. This is remarkable in a scientific endeavor that typically sees 5% a year in improvement at most. It is reasonable to expect continued improvements as the research intensity in the NMT field continues and as we at SDL continue to refine and hone our NMT strategy. The degree of fluency and naturalness of the output, and its ability to produce a large number of sentences that are very fluent and look like they are from the human tongue drives much of the enthusiasm for Neural MT. Human evaluators often consider the early results, with Neural MT output, to be clearly better, even though established MT evaluation metrics such as the BLEU score may only show nominal or no improvements. The Neural MT revolution has revived the MT industry again with a big leap forward in output quality and has astonished naysayers with the output fluency and quality improvements in “tough” languages like Japanese, German and Russian. An example of SDL’s MT competence was demonstrated recently, when the SDL research team announced a breakthrough with Russian MT, where its new Neural MT system outperformed all industry standards, setting a benchmark for Russian to English machine translation, with 95% of the system’s output labeled as equivalent to human translation quality by professional Russian-English translators. Additionally, SDLs broad experience in language translation services and enterprise globalization best practices has also enabled them to provide effective MT solutions for many enterprise use cases ranging from eDiscovery, localization productivity improvements, global customer service and support to broad global communication and collaboration use cases that make global enterprises more agile and responsive to improving CX across the globe. The ability to be tuned and optimized for enterprise content and subject domain. The ability to provide assured data security and privacy. 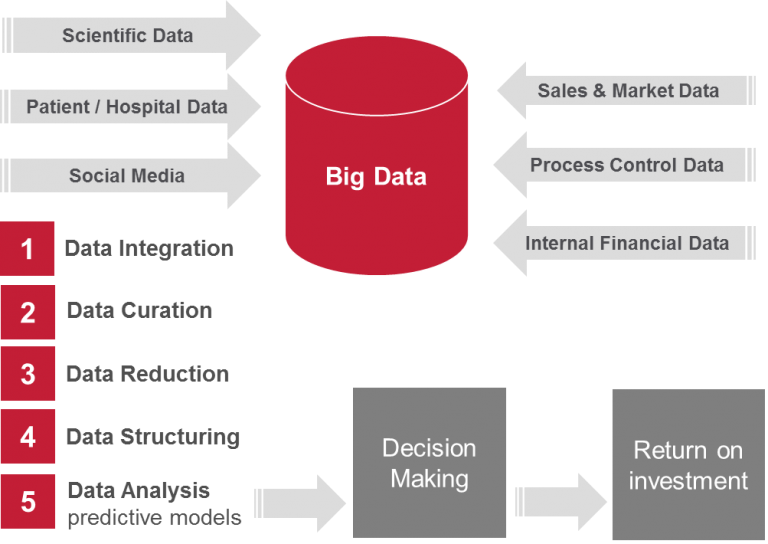 The integration into enterprise infrastructure that creates, ingests, processes, reviews, analyzes, and generates multilingual data. The ability to deploy MT in a variety of required settings including on-premises, private cloud or a shared tenant cloud. The availability of expert services to facilitate tailoring requirements and use case optimization. What is clear today, is that the Life Sciences industry can gain business advantage and leverage from the expeditious and informed use of MT. It is worth reviewing this technology to understand this impact. MT can transform unstructured data, such as free-text clinical notes or transcribed voice-of-the-customer calls, into structured data to provide insights that can improve the health and well-being of patient populations. Improve large-scale population screening to identify trends and at-risk patients. MT and text mining together will enable the enterprise to process multilingual Real World Evidence (RWE) and generate Real World Data (RWD) to inform all phases of pharmaceutical drug development, commercialization, and drug use in healthcare settings. Regulatory bodies like the FDA could also utilize additional data related to drug approval trials by expanding to more holistic data during the product approval process – for example, they can also review multilingual internal data from international reports, and multilingual external data from social media that MT can make available for analysis. This could enable much faster processing of drug approvals as more data would be available to support and provide needed background on new drug approval requests.